What new student isn’t feeling a bit lost when trying to adjust to college life? 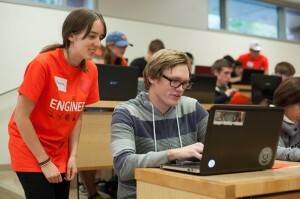 To help with the transition, the College of Engineering Information Technology (COE IT) team organizes an annual group seminar for first-year and transfer students to get their computers ready for the school year. Volunteer Shanna Myers assists Chris Haines during the IT orientation. At the start of fall term, roughly 180 students gathered every hour to learn about computer security, installing essential programs, and even scheduling first-year advising appointments. Since each engineering student is required to have a laptop, security is a critical component to the college’s IT efforts. Dozens of student volunteers assisted to ensure all 1,386 incoming students met security requirements for the 2013-2014 school year. Speaking of the school year, the IT team helps with that as well! In addition to providing valuable technology resources, the team stresses the importance of staying organized by subscribing to the Engineering Events Calendar, which alerts students of important upcoming dates. By attending the seminar at the beginning of every year, students get specialized, hands-on assistance and build a solid foundation for the rest of their time at Oregon State. And they might not feel so lost after all. Andrew Bluett is one of the first students in the Graduate Fellowship Program through the School of Mechanical, Industrial, and Manufacturing Engineering. The School of Mechanical, Industrial, and Manufacturing Engineering has launched a new collaborative graduate program that brings together classroom and industry experience. Now in its second year, the Graduate Fellowship Program has students spend a portion of their time at Intel to develop hands-on skills and relevant experience within the private sector before graduating with a Master of Science in Industrial Engineering. 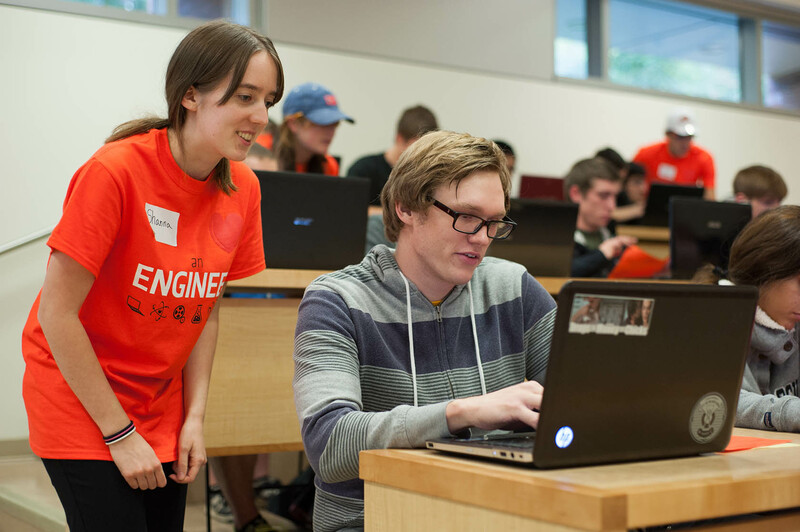 For each year in the program, students take two terms of coursework at Oregon State before spending their second two terms at Intel. Starting with coursework ensures students integrate classroom concepts into their internship. John Parmigiani, research assistant professor of mechanical engineering and director of industry research and outreach, was integral to forming the collaborative program. He hopes the partnership provides insights into future career options. “If students choose to go into industry, they know the expectations, contacts, and what they need to do to be successful,” he said. On the other hand, if students choose to become a professor, their experience with industry will help tremendously when advising students, he added. 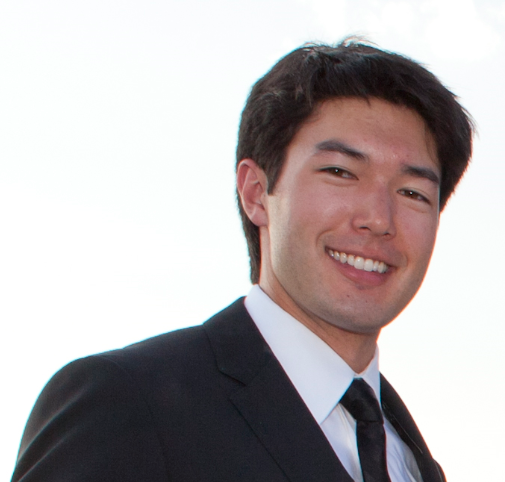 Andrew Bluett is a second-year student and one of the first to participate in the Graduate Fellowship Program. He said the combination of traditional classroom skills and valuable time with a prominent software company was appealing. In the future, Parmigiani hopes to increase enrollment and partner with additional companies. While students are currently participating in internships independently, broadening the program will help professors match students with companies best suited for their talents and area of study, while also creating more professional networking opportunities. Parmigiani stressed the program’s unique approach to delivering a relevant education is a strong selling point. “Providing professional experience while working side-by-side in the industry, all while writing a thesis and attending school, is not something you get at every graduate school,” he said. Applications are being accepted in January 2014, and all interested students are highly encouraged to apply. Posted in Industry, Programs, Students. 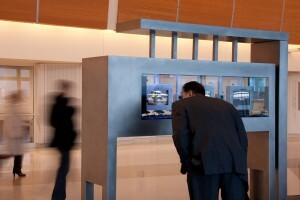 Dreaming FIDS, a public art installation by Shona Kitchen, sits in the departure lounge at Mineta San Jose International Airport in California. The college will host a visiting artist lecture series as part of a new partnership between arts and engineering on the Oregon State campus. 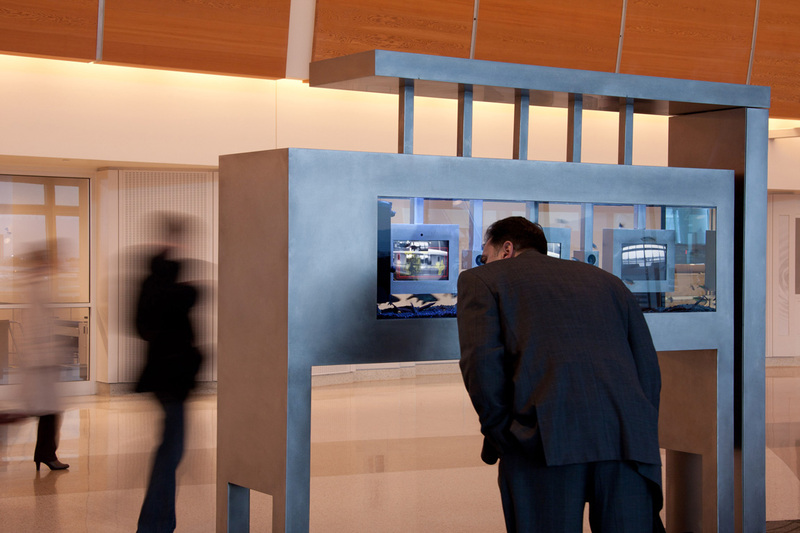 Acclaimed visual artist Shona Kitchen kicks off the series on October 10 with her lecture “Technological Landscapes.” Kitchen is an internationally renowned multidisciplinary artist/designer with a passion for technological advancement and architecture/interaction design. The talk will take place October 10 on the Oregon State campus in Owen Hall, Room 102 from 6-7 p.m.
“In this seminar series we have invited artists who have successfully integrated technology into their art work to discuss the process, what questions they address and how working with interdisciplinary teams drives and informs the artistic process,” said Cindy Grimm, a robotics professor at Oregon State who has been instrumental in planning the series along with colleague William Smart and other faculty from both the colleges of Engineering and Liberal Arts. The series is just one of many efforts between the colleges to foster common ground between the creative and technical disciplines. “The landscape between art and technology can be challenging to navigate – but it provides an unprecedented opportunity to explore how humans come to terms with our ever-changing, technology-driven world,” said Grimm. October 10 from 6-7 p.m.